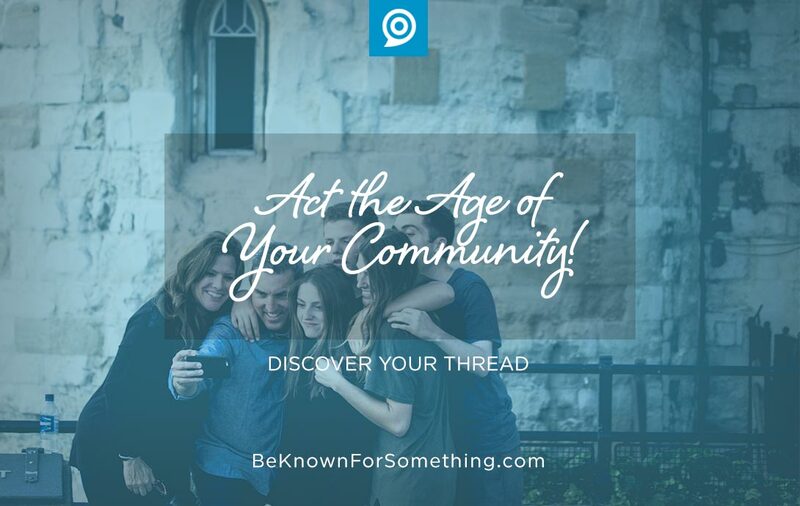 Be Known for Something : Discover Your Church Communication Thread / Communications / Act the Age of Your Community! The (big-C) Church covers the globe through a web of local ministries. We’re part of the Church because of our relationship with Christ. Why are we part of our local (small-c) churches? Because it’s in our local community and represents our faith understanding. Based on the community’s diverse beliefs, denominational churches arise so that there are enough to facilitate the belief mosaic of the area. Most people will drive about 20 miles or less to a church. There are very few churches who are established because of age alone. Some cater to young people and some to older people; but mostly, the church has various age ranges who are attracted to the worship style offered. If you have a church that has a worship style that attracts mainly older people, then the community needs to have enough older people who agree with your beliefs to make the church successful (or pay the bills). Often, we’re asked about the health of a local church. We like to start with their “age”. From internal information, we calculate the average age (or median age) but often, we simply “calculate” the age by attending regular, average, Sunday morning services to get a sense of the age of the congregation. In order for a church to be healthy, they should represent the greatest potential (age-wise) in their community. For example, if it’s a retirement community, we expect the congregation to feel older. In America today, the largest demographic group is the Millennials (roughly age 14 – 33), so each time we analyze a local community demographic, we often see a bubble of Millennials. Rarely does the church feel that young. Why? Because the leadership is usually older, and they’re conducting services in a manner that they like. The buildings, and their interior style, are always getting older and traditions continue to age. Want your church to be healthy? Start acting the age of your community. And that’s often much younger than you think. I’m not saying to change the message or beliefs. I’m just suggesting that your paint, decor, worship methods (that are preferences), and communications have to start attracting and appealing to the younger demographic or our churches are going to “age out” of existence. The church relies on an audience of believers. Therefore always start with your community to determine your preferences and styles. Then share the life-changing, ageless faith of Jesus Christ. Let’s be relevant!